VODKA Let’s Re-Do Brunch! 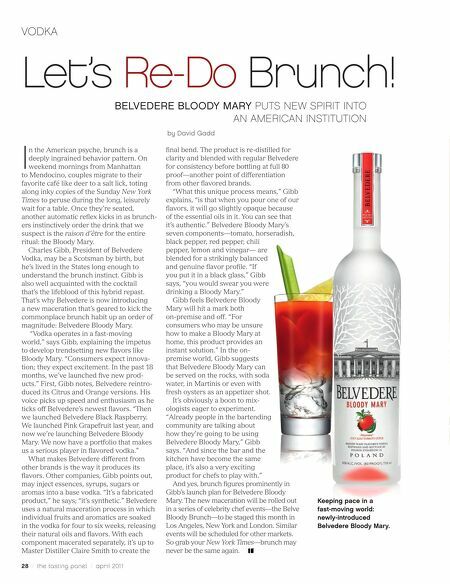 I BELVEDERE BLOODY MARY PUTS NEW SPIRIT INTO AN AMERICAN INSTITUTION by David Gadd n the American psyche, brunch is a deeply ingrained behavior pattern. On weekend mornings from Manhattan to Mendocino, couples migrate to their favorite café like deer to a salt lick, toting along inky copies of the Sunday New York Times to peruse during the long, leisurely wait for a table. Once they’re seated, another automatic reflex kicks in as brunch- ers instinctively order the drink that we suspect is the raison d’être for the entire ritual: the Bloody Mary. Charles Gibb, President of Belvedere Vodka, may be a Scotsman by birth, but he’s lived in the States long enough to understand the brunch instinct. Gibb is also well acquainted with the cocktail that’s the lifeblood of this hybrid repast. That’s why Belvedere is now introducing a new maceration that’s geared to kick the commonplace brunch habit up an order of magnitude: Belvedere Bloody Mary. “Vodka operates in a fast-moving world,” says Gibb, explaining the impetus to develop trendsetting new flavors like Bloody Mary. “Consumers expect innova- tion; they expect excitement. In the past 18 months, we’ve launched five new prod- ucts.” First, Gibb notes, Belvedere reintro- duced its Citrus and Orange versions. His voice picks up speed and enthusiasm as he ticks off Belvedere’s newest flavors. 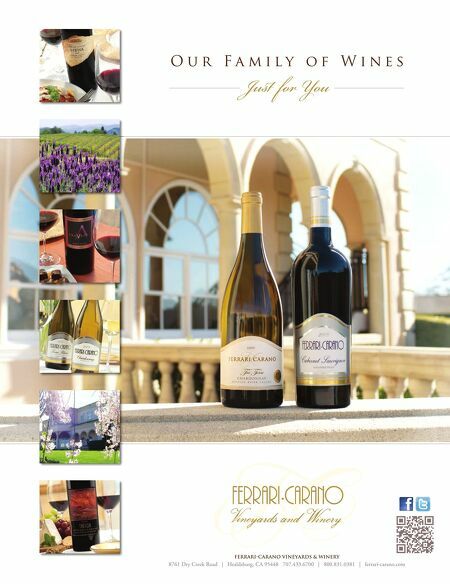 “Then we launched Belvedere Black Raspberry. We launched Pink Grapefruit last year, and now we’re launching Belvedere Bloody Mary. We now have a portfolio that makes us a serious player in flavored vodka.” What makes Belvedere different from other brands is the way it produces its flavors. Other companies, Gibb points out, may inject essences, syrups, sugars or aromas into a base vodka. “It’s a fabricated product,” he says; “it’s synthetic.” Belvedere uses a natural maceration process in which individual fruits and aromatics are soaked in the vodka for four to six weeks, releasing their natural oils and flavors. With each component macerated separately, it’s up to Master Distiller Claire Smith to create the 28 / the tasting panel / april 201 1 final bend. The product is re-distilled for clarity and blended with regular Belvedere for consistency before bottling at full 80 proof—another point of differentiation from other flavored brands. “What this unique process means,” Gibb explains, “is that when you pour one of our flavors, it will go slightly opaque because of the essential oils in it. You can see that it’s authentic.” Belvedere Bloody Mary’s seven components—tomato, horseradish, black pepper, red pepper, chili pepper, lemon and vinegar— are blended for a strikingly balanced and genuine flavor profile. “If you put it in a black glass,” Gibb says, “you would swear you were drinking a Bloody Mary.” Gibb feels Belvedere Bloody Mary will hit a mark both on-premise and off. “For consumers who may be unsure how to make a Bloody Mary at home, this product provides an instant solution.” In the on- premise world, Gibb suggests that Belvedere Bloody Mary can be served on the rocks, with soda water, in Martinis or even with fresh oysters as an appetizer shot. It’s obviously a boon to mix- ologists eager to experiment. “Already people in the bartending community are talking about how they’re going to be using Belvedere Bloody Mary,” Gibb says. “And since the bar and the kitchen have become the same place, it’s also a very exciting product for chefs to play with.” And yes, brunch figures prominently in Gibb’s launch plan for Belvedere Bloody Mary. The new maceration will be rolled out in a series of celebrity chef events—the Belve Bloody Brunch—to be staged this month in Los Angeles, New York and London. Similar events will be scheduled for other markets. So grab your New York Times—brunch may never be the same again. Keeping pace in a fast-moving world: newly-introduced Belvedere Bloody Mary.